This section allows site administrator to setup types of ads displayed on site pages. Settings can be applied to the following pages: Index Page, Search Page (before and after registration) and member’s homepage. No ads. Administrator may choose not to display any ads. Ads can be displayed either by rows or by list. 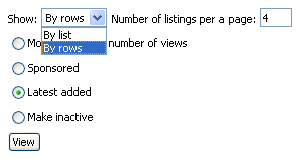 Administrator can set number of ads per page (in case display by list is chosen) and number of ads in a row (if display by rows is chosen). After you apply settings, click ‘Save’ button.